Species: Cebidichthys violaceus (Girard, 1854); from the Greek cebidichthys (two words meaning Sapajou—a kind of monkey, and fish); and the Latin word violaceus (meaning violet). 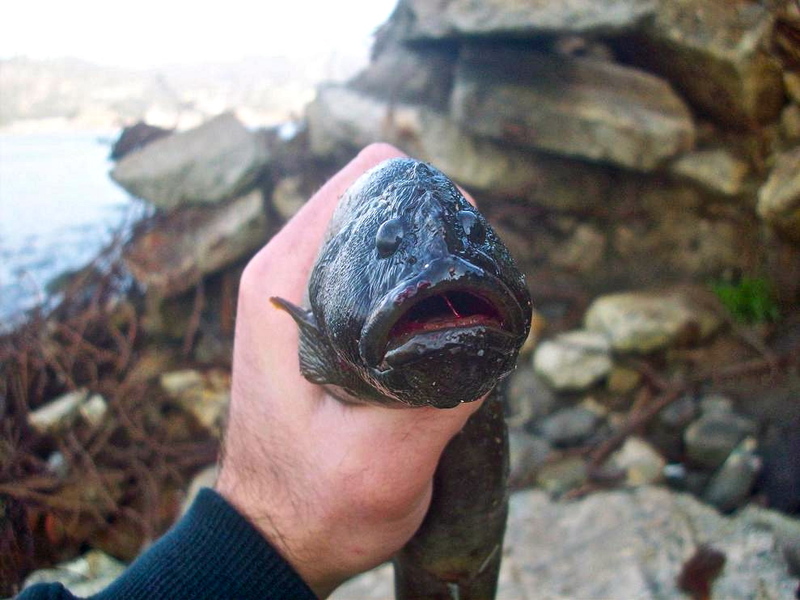 Alternate Names: Monkeyface prickleback, blenny eel, monkeyface blenny. Called abrojo cara de mono in Mexico. 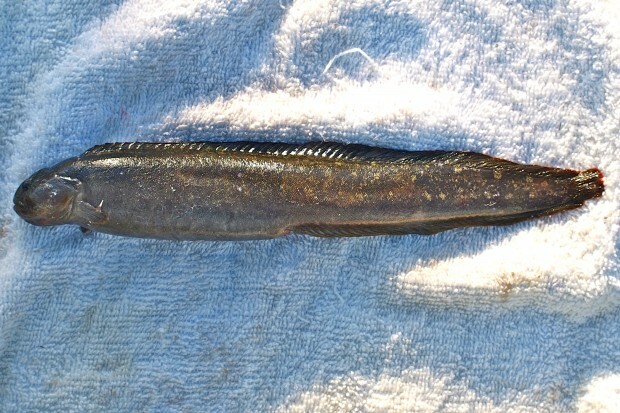 Identification: Typical eel shape. Adult fish have a lumpy ridge on the top of the head. 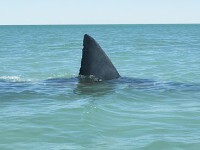 Dorsal fin is about half spines and half soft rays. Uniform dull black, olive or gray with 2 darker bars radiating downward from the eye. 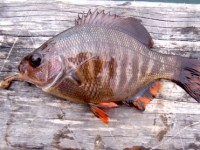 Some fish have been noted with orange spots on the body or orange at the edge of the fins. Size: Length to 30 inches. 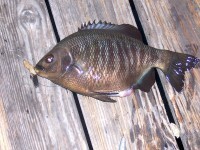 Most caught from piers are 12-24 inches long. 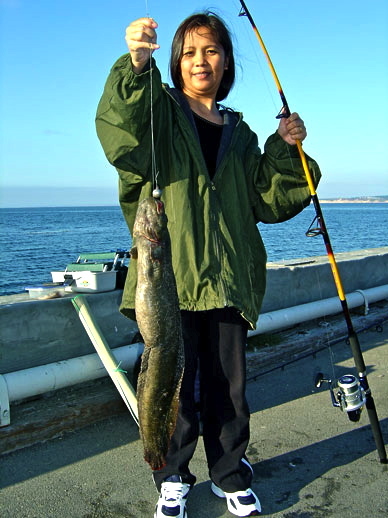 The California record was a 6 lb 1 oz fish taken at Pescadero in 2005. Range: Bahia San Quintin Bay, northern Baja California to southern Oregon; rare south of Point Conception. 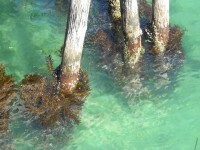 Habitat: Intertidal to 80 feet deep; common in shallow rocky areas. 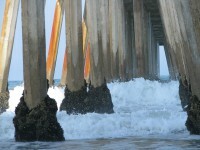 Piers: Generally found at piers in rocky areas or where debris has accumulated at the base of the pier. 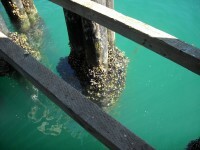 Best bets: Monterey Coast Guard Pier (the best), Princeton Harbor Pier, Fort Point Pier, San Francisco Municipal Pier, Angel Island Pier and Elephant Rock Pier. Shoreline: A favorite species for anglers fishing rocky areas and jettys from Point Conception to San Francisco (especially poke polers). 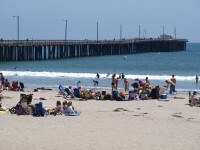 Favored areas include Shell Beach (near Pismo Beach), rocks and jetties near the Golden Gate, rocks between Stinson Beach and Muir Beach, rocks between Bodega Bay and Dillon Beach, and rocks north of Crescent City. Bait and Tackle: Medium tackle; size 4-2 hooks; cut bait (squid), shrimp, pile worms or fresh mussels. The eel’s most common food is crustaceans and algae. Comments: Very hard to catch from a pier. Will strike bait and then immediately head back to its rocky lair. Anglers must strike quickly and then keep the pressure on the fish to force it away from the rocks. 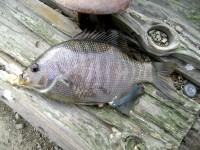 More commonly caught by “poke poling” in rocky areas along the shoreline. 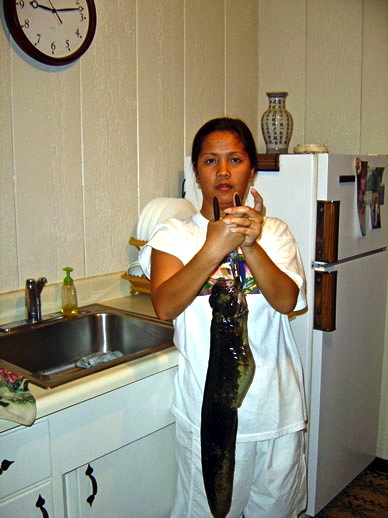 Pinoy’s wife getting ready to prepare some monkeyface eel for dinner. An interesting look at a monkeyface’s face! How about eating the monkeyface eels? Here’s an interesting article on how well they are respected as food in the Bay Area. SAN FRANCISCO — As chef Mateo Granados sets the platter on the table at his Mateo’s Cocina Latina in Healdsburg, the “oohs” and “aahs” roll forth. Plus here and there, “yikes.” It’s difficult not to react to the star ingredient of this supper. It’s monkeyface eel, and as Granados serves it whole, the 3-pound creature stares up at the people who are about to consume it. Imagine the big bulging eyes of Marty Feldman, the bloated collagen lips of performance artist Amanda Lepore, and a lumpy rhino ridge on the head that ends in a blunt bulldog nose. Granados presents it with its downturned mouth propped open, the better to view its tiny spiky teeth. Then he fillets it, and within seconds, the flesh is separated from the nearly 2-foot long body for diners to dig into. This is one of the more dramatic preparations for the eel, which suddenly has been showing up in restaurants in the North Bay and San Francisco, prized for its delicate yet meaty texture and its clean whitefish flavor. Diners who have discovered it are reserving the limited-catch species in advance, and when guests see it listed on Mateo’s specials chalkboard, it sells out. 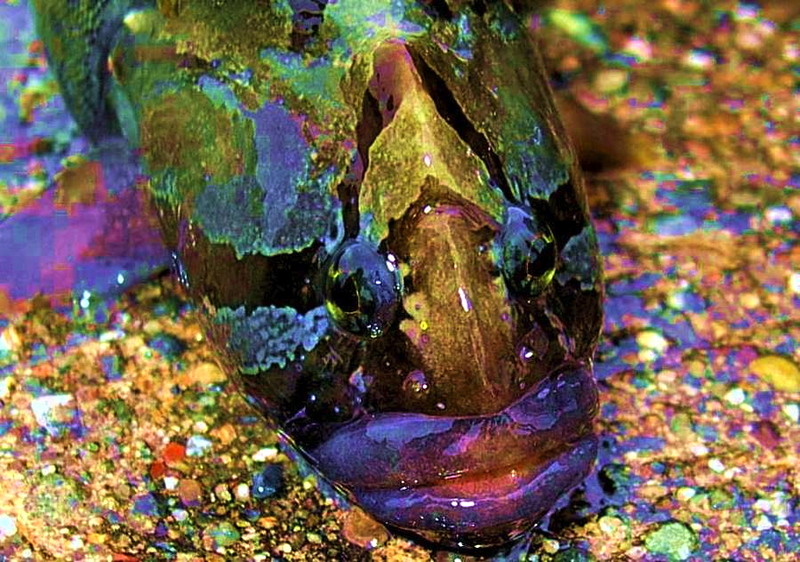 Monkeyface eel is not actually an eel, but a fish, from the rock prickleback family. It has two small fins hanging like floppy ears near its head, and a dorsal fin down its back, yet it barely swims, preferring to lurk instead close to shore in rocky reefs and tidal pools along the Pacific coast from Baja California to Oregon. And as Granados and his curious customers have learned, it is a piscatorial pleasure, roasted in aromatic herbs and smothered in citrus segments with warmed olive oil, Preston black olives, capers and Middleton Farm baby broccoli alongside crispy Tommy Boy’s potato skins. Kenny Belov was the first to offer monkeyface last summer, at his Fish restaurant in Sausalito, where he sends it out in paella, or sliced and broiled with salt, pepper and olive oil as an appetizer. In November, Nojo chef-owner Greg Dunmore got hooked, putting it on the menu at his San Francisco restaurant. In December, Granados unveiled his first recipe, dressed in a fusion style of French, Asian and Spanish preparations that he changes nearly every time he serves it. Beyond tasting good – Dunmore compares the taste to Thai snapper, with none of the chewy oiliness often found in unagi – the chefs say they appreciate that monkeyface offers an excellent local alternative to other overfished species like monkfish or imported mahi mahi, which are both on the Monterey Bay Aquarium’s sustainable Seafood Watch Guide as fish to avoid eating. “They’re so delicate and mild, they accept all sauces and preparations,” Belov said. Customers snap up Belov’s stock of as many as 10 a day, and even buy the creatures whole from his retail shop at $14.99 a pound. “People love it, they ask a lot of questions, and it’s fun for our staff to tell the monkeyface story,” he says. Dunmore finds that no one minds the strange name, either. “It’s hard to keep it in the house when guests find out we have it,” he says, noting that he goes through up to 15 orders in an evening. He skins it, fillets it and tempura-fries it, then serves it with a light broth of dashi, soy, mirin and a flourish of his momiji oroshi (shaved carrot and daikon), or barbecues it with ginger and lays it atop crispy rice cake. For Granados’ kitchen, more is better with the versatile fish. A recent preparation found it grilled, then roasted standing up so both sides could cook evenly. The chef buried it in black hedgehog mushrooms, local Dungeness crab in Meyer lemon cream sauce, Sonoma County vegetables and a crisp knob of Redwood Empire Farm fennel tempura. 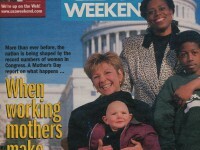 The family-style meals, served with sides, generally feed four for $125. The decidedly homely critters are relatively easy to catch, according to monkeyface eel expert angler Kirk Lombard. 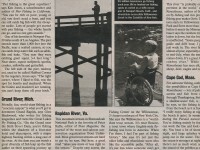 He holds the California record for the largest monkeyface ever caught (6.1 pounds), and sells to Sausalito’s TwoXSea, a seafood distributing company also owned by Belov. Lombard uses a method called poke poling, rigging up a long bamboo pole with a short wire leader and a small baited hook on the end, and poking it into rock crevices to find the fish. It may seem like an odd pastime, Lombard admitted, but part of his motivation is to develop the market for underutilized species and help combat the extinction of others. 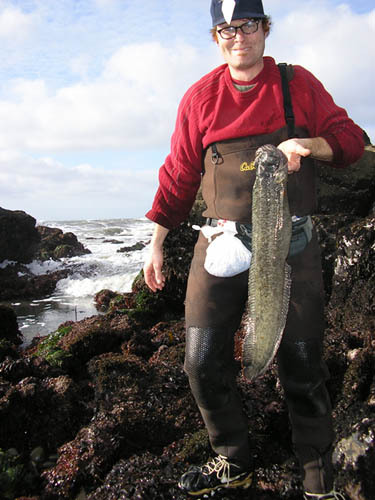 Commercial fishery of monkeyface eels is insignificant, according to the Monterey Bay Aquarium, and Lombard says he believes he is the only angler in California catching them for profit via his Sea Forager business. I make two cuts. Start at the collar right behind the head and go down to the bone, then pull the knife all the way to the tail, but stop before you finish the cut–this makes it really easy to remove the skin. Flip it over and repeat. You will have two filet “belts” that peel away from the fish. Don’t worry if it looks like you missed some bones in the middle of the filet. They are just tendons and they will vanish when the flesh relaxes. An easy and tasty marinade can be made with chopped garlic and a sweet white wine like Gewurztraminer. Let it sit for an hour. 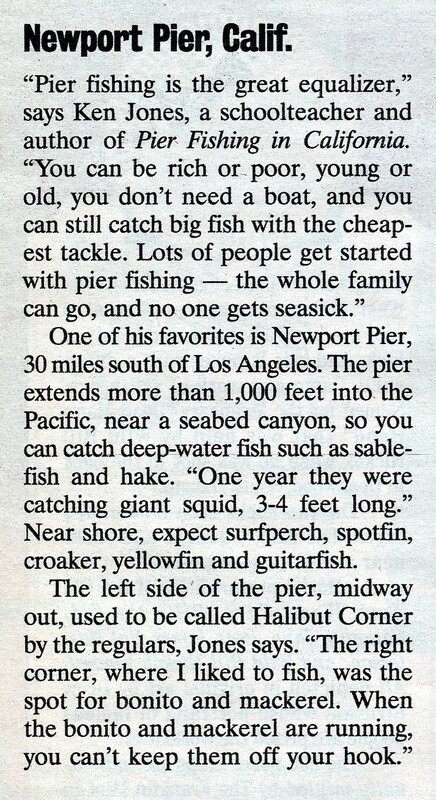 Posted in Daily musings... and tagged with California piers, Monkeyface Eel, Monterey Coast Guard Pier, Pier Fishing in California, pierfishing, saltwater fish, saltwater fishing, South T-Pier in Morro Bay. RSS 2.0 feed. 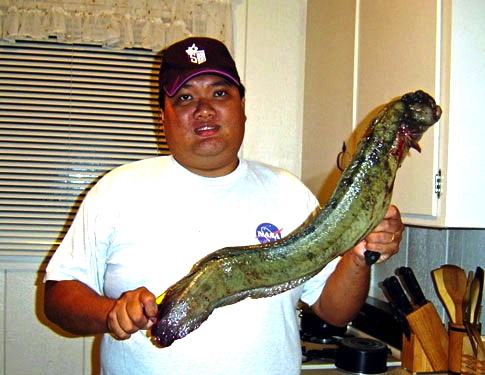 Are there monkeyface eels in the socal area around the rocks and jetties in Newport/balboa? As mentioned in the article, they really are not common south of Point Conception. There’s always the chance of seeing one but it’s not a good chance. 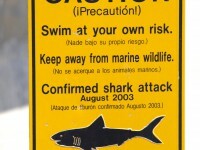 You have a much better chance of catching a moray eel from that area.